Sports involving competing against oneself have always been my fuel. Whether it was running cross country in high school or making the decision to start weight training upon entering university, I love being able to do something today that I wasn’t capable of the day before. About two years ago, I wanted to formally take this approach with my personal habits. Initially, I used a combination of daily visits to r/GetMotivated and the web app, chains.cc. The GetMotivated subreddit is a fantastic collection of inspirational posts1 and is a factor that has remained constant throughout my journey of building a better self. But, chains.cc actually served as more of a crutch than a boost. chains.cc allows you to enter various habits and each day that you complete them, you add a day to your chain. The problem lies in its emphasis on forming long chains. Sure, not breaking a long chain is motivation to keep up a habit, but it also serves as a huge downer when you break it. So, instead of focusing on the fact that I was able to get into the gym for 20 days last month, I’m left with a stark reminder that I broke a daily streak I was on. Clearly, this perspective on habits wasn’t going to work in the long term. That’s when I found Lift (now rebranded as Coach.me). 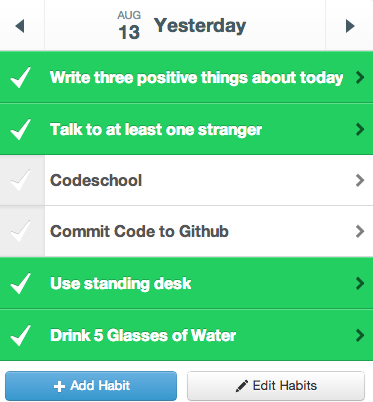 An iOS and web app that takes a more solid approach to habits. 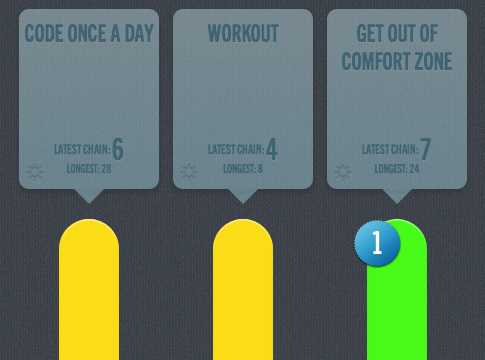 Like chains.cc, Lift allows you to add specific habits and track them from day to day. However, in creating a better self, you are not alone. Lift buckets you with other people striving towards the same goals. So, after checking off a habit, I often get random ‘props’ from people2. While this may seem silly, the feedback loop is amazing. It’s like people giving you high fives along the marathon we call life. Two other key features that set Lift apart are reminders and a focus on milestones. Reminders make perfect sense3. In the morning, I get pushed a reminder to use a standing desk, midday, a reminder to talk to a stranger, and at night, I wrap up with writing three positives things about today. Unlike chains.cc, milestones help alleviate the stress of breaking chains. Instead, you’re rewarded when you hit specific phases in a habit (e.g. tenth checkin or mini streaks). Out of the habits I’ve started forming with Lift, I’d like to point out one in particular. Writing three positive things about today4. 40 days into it, this habit has allowed me to have a stream of consciousness like never before. Whether I just feel great after a workout or make an awesome first impression, I constantly look for the gems in life. Imagine looking at this log just a year from now, 1095 things that made your days amazing. These are a few of the tools I use to build a better self. I’m still learning, tweaking, and testing my approach. But, that’s the beauty of it. Becoming better than you were yesterday is not merely a habit, it’s a way to live life5.